It all began with Uwe’s faible for France. Where, he thought, might the barometer be set fair for weather and inspiration in answer – The South of France. A house was soon located near Nice to take the whole team and it’s equipment in January; but the visions of olive groves and palm treet which enhanced everybody’s Christmas proved to be a mirage. When the band arrived, they opened the door onto a damp hovel whose most interesting features rage of bugs. It was here, at around 2.30 am on the first night, that NENA wrote her contribution to the LP – “Du kennst die Liebe nicht”, in a few hours on Carlo’s guitar. Her comment: ” I work best under pressure!”. But there was no atmosphere. The creepies crawled over the floor, the spiders scuttled over the mixers – until finally NENA (“I love animals really!”) could stand no more, and the band jetted back home. There, safe inside the cosy, egg-box clad walls of the Spliff Studios in Moabit, they listened to Uwe’s polished demos, Jürgen’s playful computer tracks and Carlo’s collected lyrics. Slowly the LP began to take shape. Extra power touched down in the form of Lisa Dalbello, the avant-garde Canadian rock singer, who flew in specially to translate the NENA lyrics. Her sensitive English versions of their ideas delighted the band and open up a lot of new doors outside of Germany; she also contributed some of the most interesting choral passages on the record. Along with Spliffer Reinhold Heil in the dual role of producer and sound engineer, the NENAs flew to Ibiza next, to work on the vocal parts. For NENA herself it was the chance to pull out everything she had learnt in the way of voice training, breathing technique and sheer physical power. In just ten days and nights of intense concentration, they had most of the songs on tape. Then it was off to London, where the first mixing was done in the legendary Sarm Studios. Here, during night-time sessions, crack American saxophonist David Sanborn laid down his beautiful sax parts. When the studio time was up they returned to Berlin to do the final mixing in the Spliff and Audio Studios there. 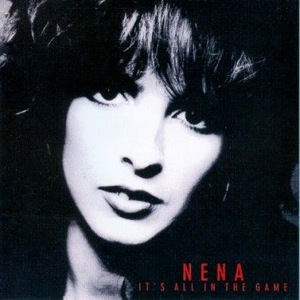 And finally – almost suddenly – there it was – “Feuer und Flamme”, the new NENA LP in English, German and CD versions!! The album is the most ambitious work ever recorded by a German pop group – stunningly fresh, musically mature and technically dazzling. And now it’s finished, how are the five NENAs spending the summer? You’ve guessed it – hard at work rehearsing a new stage show, with four guest musicians and a giant programme, for the big NENA TOUR, due to set light to Europe and Japan this autumn. “Feuer und Flamme” – hot stuff indeed!